Wait, Cars is actually a racing game this time around? Blasphemy! This shouldn't come as a surprise, considering the nature (and title) of the license, but sadly it does: Cars: Mater-National for Nintendo DS is an actual, legitimate racing game. Why the shock? Because the original Cars game for DS made poor use of the animated license about talking four-wheelers, instead opting for an unremarkable collection of touch-screen minigames. Luckily, Mater-National rights the apparent wrong, tossing players in the driver's seat of shiny red coupe Lightning McQueen as he takes on a series of international racers. The DS iteration drops the open-world setting of the console versions, but maintains bits and pieces of the story throughout its 17 races, including a CG intro and closer. Challenge Mode tosses another 28 events into the mix, reusing the story mode tracks with elimination, checkpoint and trophy collection variations. Single and multi-card multiplayer races for up to four players extend the experience even further once the brief narrative concludes. 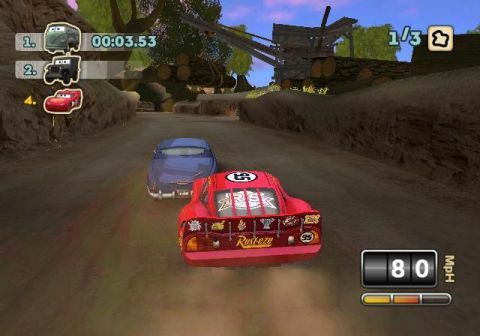 As arcade-style racing games go, Mater-National is rather vanilla, with a refillable boost meter acting as the only distinctive element of the experience. Other power-ups and weapons are nowhere to be found, but the tracks do include a healthy amount of shortcuts and hazards. The desert, forest and speedway settings do not otherwise pack a lot of personality, but that's more of a knock on the license and the hardware than the development team. Rubberbanding appears to be a conscious design decision in Mater-National, as the pack always stays together and you'll have no issue catching up should you fall behind. Mater-National starts off strong in the visual department, with crisp vehicles and environments; but the cracks (though insignificant at times) begin to show fairly quickly. Pop-in is a regular issue, especially on straightaways, as environmental details in the distance appear out of nowhere; and the typically smooth frame rate can take a major hit when multiple competitors are on screen or during sharp turns.